The recent publication of Social Panorama of Latin America, a report by the United Nation’s EconomicCommission for Latin American and the Caribbean (CEPAL in its Spanish acronym), has caused a stir in Venezuela’s pressand social media. In the report, Venezuela is the only country in the region to show an increase in poverty rates measured by income in the last year covered by the study. To understand the significance of the report, some clarification is necessary. First, the statistics used by CEPAL in all its reports can be found in the official sources generated by each country. In the case of Venezuela, all the calculations are based on the figures of the Sample Households Survey (Encuesta de Hogares por Muestreo), which has been carried out every year since 1967 by the National Statistics Institute (INE). Secondly, the data is not new. It reflects information on poverty measured by income which has been available in the INE’s web page since May 2014. The Social Panorama report compares the results of the second semesters of 2012 and 2013 for every Latin American country. Indeed, the report expresses concern over the fact that in most Latin American countries social achievements have ground to a halt: since 2011 the rhythm of poverty reduction has decreased and, because of demographic growth, the number of people in poverty in the region increased to 165 million in 2013. The main reason for these results is economic: Latin America had less GDP per capita growth in the 2012 and 2013 than in previous years. But without a doubt the most striking result is the poor performance of Venezuela’s indicators when compared with the regional average. Venezuela’s GDP growth has been consistently below that of the rest of the region, except for the year 2012 (the year of the last presidential elections in which Hugo Chávez was a candidate.) During the same period Venezuela’s unemployment figures were above the regional average, and its inflation (56.2% for 2013) set a record for the region (with a 6.8% average.) High inflation meant a decrease of 4.4% in the real mean salary of Venezuelans, and this explains a big part of the increase in poverty rates measured by income. Income inequality is yet another element that is analyzed in the Social Panorama report for 2014. The GINI coefficient for the period 2002-2008 had shown that Venezuela significantly outperformed the rest of Latin America in its decrease of inequality levels. But for the period 2008-2013, Venezuela has shown very small gains in reducing inequality, only above Dominican Republic, Panama, and Costa Rica. Poverty measures based exclusively on indicators of declared household income have limitations and can only show one part of the problem (in this post I discuss the pros and cons of the measurement methods used in Venezuela.) 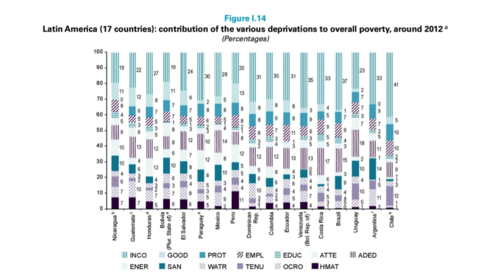 This is why it is so important that the 2014 Social Panorama report from CEPAL also includes a multidimensional measurement of poverty for Latin American countries. The Multidimensional Poverty Index (MPI) is a measurement methodology devised by the Oxford Poverty and Human Development Initiative (OPHI). In contrast to the methods based on income, usually used by multilateral agencies, it proposes the creation of an index that not only allows for a more precise identification of the population in poverty, but also makes possible the design of public policies based on the magnitude and type of specific needs for the population of each country. Several countries in Latin America have already adapted the MPI to their national context and use it as part of their official poverty figures, together with the more traditional methodologies such as the Poverty Line. There has been research done in Venezuela to try to adopt the MPI, however this methodology is still not part of the INE’s official figures. The MPI calculated by the CEPAL in the report includes the following dimensions: dwelling conditions; basic services (drinkable water, sanitation, and energy); living standards (income and durable goods of the household); education (non-attendance at school, schooling gap, and low educational attainment); and employment and social protection (unemployment and lack of social protection, including lack of health insurance and retirement plans.) This measurement includes more dimensions than the traditional method of Unsatisfied Basic Need (UBN), and for a household to qualify as multidimensionally poor it should show needs in at least 25% of the indicators of the index. For the period of 2005-2015 the MPI shows a downward trend for Venezuela: the poverty rate according to this index fell from 32% to 19% of the population. This figure is in keeping with the rest of the region. Those countries which started from a better position are the ones that show the biggest decline during the period. However, is this result compatible with the other findings about the social situation of Venezuela? The figures of Unsatisfied Basic Needs provided by the INE do show a downward tendency for the 2005-2012 period, which can be explained by an improvement in access to education for the school age population, in the conditions of dwelling and on economic dependency. Also, to explain this trend it is necessary to remember that 2012 was the year of a presidential election in the context of high oil prices. This allowed for a level of public spending that had a positive impact on the life conditions of the population. If we look at the indicators of the MPI that contribute the most to the country’s poverty rate, we find that the most important variable is income, followed by low educational attainment. This finding confirms the achievement in terms of infrastructure and access to services the Venezuelan population accumulated during the profound transformations of the country during the last 50 to 60 years. However, problems of capacitation and lack of access to well paying jobs are still important barriers faced by the most vulnerable population trying to improve its life conditions. Does this improvement in the MPI contradict the unfavorable results of the poverty rate based on income? The answer is definitely no. Not only because the MPI includes other elements in its measurement, but most importantly because the MPI is based on data of 2012 and cannot account for the increase of poverty between 2012 and 2013. In summary, the results for Venezuela in terms of income of its population are below those of the rest of the Latin American countries, despite the gains that can be seen in the MPI until 2012. But the disheartening figures correspond to the year 2013. We still lack official figures to account for the social effect of the high inflation of 2014 (63%), the highest since 1998. The figures corresponding to 2014 have yet to be released to public opinion, but the calculations should have been already made by the INE, at least those for the first semester of 2014. Will the CEPAL include the Venezuelan data in its Social Panorama report of 2015? It all depends on the level of transparency with which the government chooses face the social and economic crisis. Dr. Lissette González is a stratification researcher at the Instituto de Investigaciones Económicas y Sociales of the Universidad Católica Andrés Bello. Read a previous version of this post in Spanish in two parts here and here. Figures: Economic Commission for Latin America and the Caribbean (ECLAC), Social Panorama of Latin America, 2014,(LC/G.2635-P), Santiago, Chile, 2014.